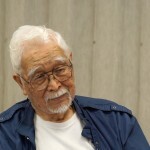 On October 21, 2015, SaveKeiro.org was able to sit down and interview the only remaining founder of Keiro, Mr. Frank Omatsu, who is adamantly against the sale of the facilities to the real-estate development firm Pacifica Companies. In the interview, he recounts how the idea of Keiro originated, why it was deemed so important, and how the community support made Keiro a reality. Japanese subtitles are available via the YouTube Player Control Panel (CC or Settings). 1) Issei: Japanese immigrant to America. 2) Nisei: The first generation born in America; the children of Issei. 3) Shin-Issei: Japanese immigrant who migrated after WWII; the "new" Issei. The interview with Frank Omatsu was very moving and educational for all the people (including me) that didn’t know the philosophy of how Keiro was founded. I am moved by the kindness and compassion the original founders of Keiro had for the elder community. Keiro is not just a nursing home, Keiro is a place to feel at home and that should never be taken away! the video of frank’s interview is quite moving. i felt he was precious water to the roots of a 100 year old oak tree. thank you everyone for keeping us engaged and realizing that dreams that came true need to stay alive and well.